General Timothy Francis O'Keefe was commander, U.S. Support Activities Group, Seventh Air Force, with headquarters at Nakhon Phanom Royal Thai Air Force Base, Thailand. General O'Keefe was born in Brooklyn, New York, in 1919. He graduated from St. Francis Preparatory School, Brooklyn, New York, in 1936 and attended St. Francis College there. In March 1940 he entered military service as an aviation cadet and in November 1940 completed flight training at Kelly Field, Texas, and was commissioned a second lieutenant in the Army Air Corps Reserve. His next assignment was as a flight instructor at Kelly Field, Texas. In June 1941 he was assigned as assistant aviation cadet supervisor of the Primary Flying School at Cuero, Texas, and in 1943 he became the commander. In January 1944 he attended the Command and General Staff School at Fort Leavenworth, Kansas, and upon graduation in March 1944 returned to the Primary Flying School as commander. Operations Staff. He reported to Randolph Field, Texas, in July 1946 for duty as assistant director and then commander of the Primary Pilot Training School. In September 1947 he entered the Air Command and Staff School, Maxwell Air Force Base, Alabama, and upon his graduation in June 1948, was assigned as air inspector at the Air Training Command, Barksdale Air Force Base, Louisiana. In July 1949 he returned to Texas, this time to Goodfellow Air Force Base, San Angelo, as commander of the 3545th Pilot Training Group. General O'Keefe next went to Japan as deputy for operations, Far East Air Materiel Command. During the Korean War in April 1951, he went to Korea as commander of the famed "Mosquito Group," the 6147th Tactical Control Group, which under his command underwent equipment improvement and tactical advances important in the development of tactical air control used in Vietnam. He returned to the United States in January 1952 and was commander of Pope Air Force Base, North Carolina, until December when he entered the Advanced Instrument Flying School at Moody Air Force Base, Georgia. Upon his graduation in March 1953, he was reassigned to Pope Air Force Base as inspector general for the Ninth Air Force. From August 1953 until August 1959, General O'Keefe served with fighter units at Alexandria (now England) Air Force Base, Louisiana, where he became deputy commander, 366th Fighter Bomber Wing, and at Seymour Johnson Air Force Base, North Carolina, as deputy commander, 83d Fighter Wing and then commander of the 4th Tactical Fighter Wing. In 1954 and 1958, General O'Keefe led the Tactical Air Command gunnery teams in the Worldwide Gunnery Meets at Nellis Air Force Base, Nevada. In August 1959 he entered the National War College in Washington, D.C., and after graduation in July 1960 was assigned to the Seventeenth Air Force in Germany as deputy chief of staff, operations. He returned to Washington, D.C., in July 1963 and was assigned to Headquarters U.S. Air Force as deputy director of operational requirements, Office of the Deputy Chief of Staff, Programs and Requirements, and in August 1964 became Assistant for Logistics Planning, Deputy Chief of Staff, Systems and Logistics. General O'Keefe entered on his second tour of duty in Japan in August 1967 as vice commander of the Fifth Air Force and earned his third Legion of Merit while in this assignment. He had previously served with the Fifth Air Force during the Korean War. In August 1968 he returned to the United States as commander of Tactical Air Command's Ninth Air Force at Shaw Air Force Base, South Carolina. In October 1969 he was appointed director for logistics, the Joint Staff, Organization of the Joint Chiefs of Staff, in Washington, D.C. He became vice commander in chief, Pacific Air Forces, in August 1971. General O'Keefe was appointed deputy commander in chief, U.S. Readiness Command with headquarters at MacDill Air Force Base, Florida., in April 1973. General O'Keefe assumed command of the U.S. Support Activities Group/Seventh Air Force, with headquarters at Nakhon Phanom Royal Thai Air Force Base, Thailand, on October 8, 1973. His military decorations and awards include the Distinguished Service Medal, Legion of Merit with two oak leaf clusters, Distinguished Flying Cross, Air Medal with two oak leaf clusters, Bronze Star Medal, Air Force Commendation Medal with oak leaf cluster, and the Korean Ulchi with silver star. General O'Keefe was in buried in Section 5 of Arlington National Cemetery. Lieutenant Richard William O'Keefe was born in Cuero, Texas, and was a graduate of the Citidel. 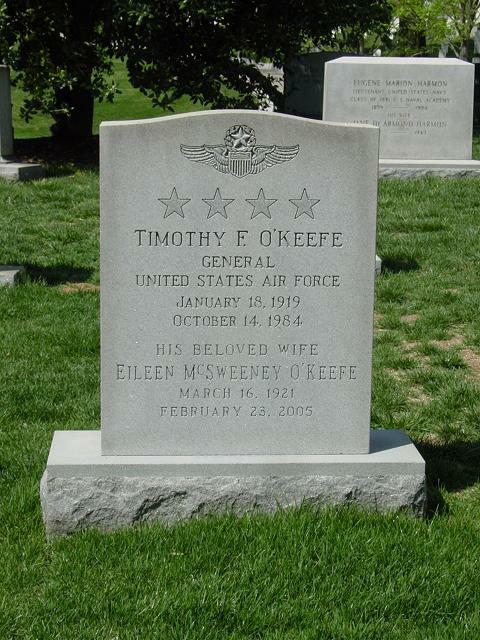 He was the son of General O'Keefe and was killed in a plane crash while returning from a mission in Vietnam 11 February 1971. He is survived by one son Dennis Michael O'Keefe. Children: Timothy Jr., Terrence, Richard, J. Vincent. Meaning that if they were at all connected by family ties - they were at least not brothers. Of course one can´t rule out that they could have been cousins, but that is beyond my scope. The strange thing is of course that some of the names of Timothy´s children resembles the names of Richard´s children - could still mean some family connection. Their fathers could have been brothers?